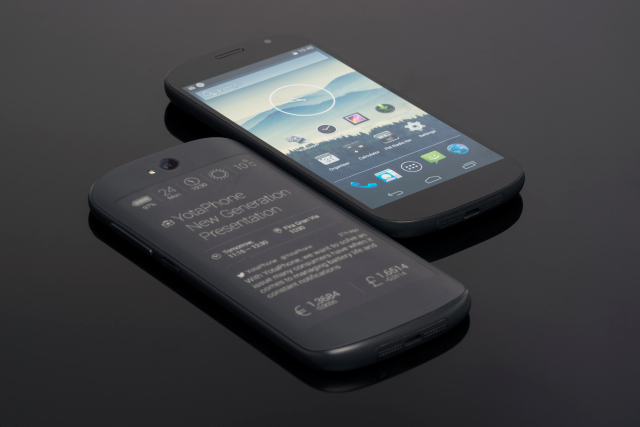 Home » Tech » YotaPhone 2, the novelty-phone, coming to the U.S.
YotaPhone 2, the novelty-phone, coming to the U.S. The famous (or infamous) Russian YotaPhone 2 is coming to U.S. shores soon enough, although not to the retail stores you would have thought. The YotaPhone 2 is famous because it is a smartphone that has not one, but two displays built in. Even though one is just an e-ink panel on the back panel of the phone, the phone itself is more of a novelty, rather than a useful gadget. You can’t deny that having two displays certainly decreases the number of times you need to flip your phone around after taking it out of your pocket or purse, but otherwise, it doesn’t add a lot of features. Those of you who tend to read a lot on a smartphone, will definitely find the e-ink display useful, though. I personally prefer hard-copy books because I wear glasses and looking at screens a lot gives me a headache. One other thing it does help with though, is keeping power consumption down. The YotaPhone 2 always-on e-ink display on the back consumes much less than the IPS front display would, because it doesn’t light up as many pixels. That comes in handy when you’re only checking for notifications, the time or bits of essential information. Power management is key in modern smartphones, as fans and tech enthusiasts are getting more and more frustrated by having to charge their phones at the end of each day. That frustration translates even more to the wearable market, but the YotaPhone 2 is not a wearable, even if the e-ink display might be more specific to that category, among others. Many consider the YotaPhone 2 to be a novelty, more than a utility, which is supported by the rather high price tag the phone comes with. That e-ink display, in many people’s opinions, does not warrant such a high price, although there are many out there who actually find it useful. I would tremendously love having a second e-ink display, as I don’t really use my phone that much, but when I do indulge in the occasional videos, games and such, I would rather be amazed at a color display. By that I mean that I would definitely stop using the main display if I had a YotaPhone 2 as my daily driver, and would get used to seeing that lovely monochrome. The refresh rates and frame rates aren’t great on the phone, but unless you want serious apps to run on the rear display, you’re going to be fine. Did I mention the YotaPhone 2 price? I didn’t and maybe I shouldn’t, but I will. Unlocked, it’s $850. Whopper. But what do you get for that price, aside from the e-ink display? Quite a lot, actually. Under the hood of the YotaPhone 2, we find a Snapdragon 800 CPU clocked at 2.2 GHz, backed by 3 GB RAM and 32 GB internal storage. Android 4.4.3 is on the Yota right now, but Lollipop should visit soon enough, according to the company. The software is pretty stock, compared to other devices on the market, but one big problem with the YotaPhone 2 is the keyboard. For some reason, it’s rubbish, no matter what third-party keyboard you use. It doesn’t register presses correctly and it sometimes can’t differentiate between taps, swipes and such, making the whole typing experience rather annoying. You get a very comprehensive app suite designed specifically for the e-ink panel, and it comes with settings and optimizations that offer far more control over your device than any other Android smartphone out there. If you want an in-depth look at these, you should watch the video from Android Authority below. If we compare the price, functionality and software suite, we actually get a pretty decent bang for buck. That is if you don’t consider the slightly inferior 8 MP camera on the rear and 2 MP camera on the front. All of the juice for the YotaPhone 2 is provided by a 2500 mAh battery, which on average use, will hold out for a day if you don’t use the e-ink display. If you do, you can go for at least 6 hours with 15 % battery. But you came here to learn about when and how the YotaPhone 2 will be available to U.S. customers. The company has come clean during the MWC 2015 and said that it wouldn’t be launching the YotaPhone 2 in retail stores, instead it’s going to go to Indiegogo, where the page of the project should be popping up soon enough. But there’s even better news! According to YotaPhone CEO Mike Kelley, the YotaPhone 2 price will drop to $600 in the U.S., which is actually quite neat. It’s still a bit much to pay, as you get a lot of bugs in the complete package, but it’s more manageable this way. If the Indiegogo campaign proves to be successful, the phone will be launched in retail stores as well, so we’re definitely looking forward to that, even though we don’t have very much confidence in it just yet. 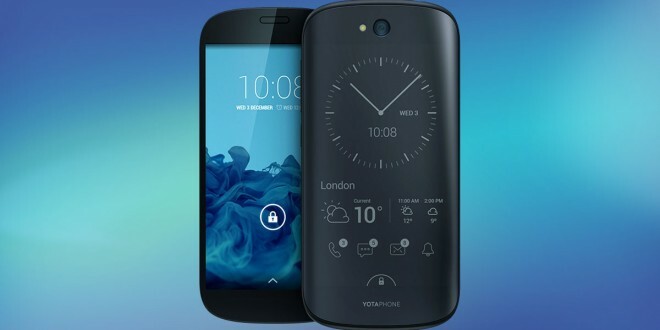 Oh and by the time the YotaPhone 2 starts shipping in the U.S., Android 5.0 Lollipop will also be made available.